Dione Restaurant is located on Nissi Avenue at Nissi beach, just on the edge of the Nissi Bay area. It is open in the summer months for lunch and dinner and serves Cypriot and international dishes. Downtown Yummy is open through out the day and evenings all year round and is located by the main traffic lights in the centre of Ayia Napa. It extensive menu contains Greek and Cypriot traditional dishes as well as kebabs and gyros. It has tables to eat on or food is also available for takeaway. 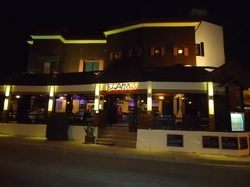 Dragon Restaurant is one of Ayia Napa's more established Oriental restaurants and serves Chinese food as well as Sushi. It is open for dinner though the summer months as well as weekends during the winter. Edelweiss Steakhouse was completely refurbished for 2013 giving it a fresh and modern new look. 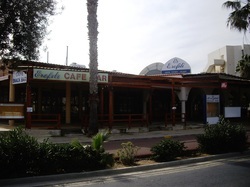 Located just off Nissi Avenue in the centre of Ayia Napa, Edelweiss serves Cypriot and international dishes. It is open during the summer months for lunch and dinner. 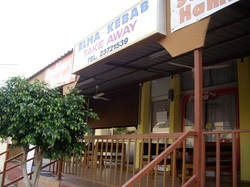 Elaine's restaurant is located behind the town hall, just off the main strip in the centre of Ayia Napa. Elaine's, formerly Sizzlers steakhouse has been completely refurbished for 2013. The menu at Elaine's includes Cypriot and international dishes and they are open for lunch and dinner. Eligonia Lobby Bar is open all year round from early morning until late at night. 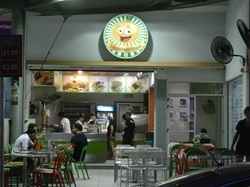 Serving snacks and main meals, the menu contains a wide range of dishes. 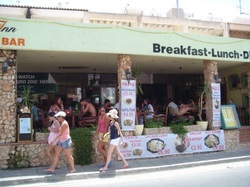 Lobby Bar is located right opposite the Monastery in the very centre of Ayia Napa. Elma offers traditional Cypriot dishes and takeaway cooked on it's charcoal grill. Open eyar round for lunch and dinner, Elma is very popular with local people and is well known as one of the best kebab houses in Ayia Napa. Located in between Petrosana and Seantor Apartments, Elma is just 5 minutes walk from the centre of Ayia Napa. The Elysian Inn is located just off Nissi Avenue and is open for breakfast, lunch and dinner during the summer months. The menu consists of a wide variety of international dishes and snacks. Erofili was completely refurbished for 2013 and now has a more modern, up to date look. Serving Cypriot, Greek and international dishes, Erofili is open in the summer months for lunch and dinner. Erofili restaurant is located close to the Grecian bay hotel. Esperia restaurant has a great location overlooking Ayia Napa harbour and is open in the summer months all day and evenings for meals and snacks. It's extensive menu offers a wide selection of seafood as well as international dishes. 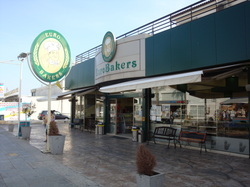 Eurobakers is located on Nissi Avenue in the centre of Ayia Napa and is open 24 hours a day all year round. It serves freshly baked pastries and pies, cakes and deserts. Sandwiches are made to order and they also have a salad bar, ice cream stand and coffee bar. 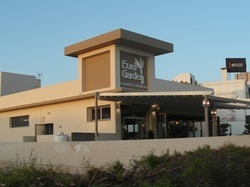 Eurogarden is new for 2013 and is located on Nissi Avenue opposite the Bank of Cyprus. It serves a range of Cypriot and international dishes and is open for lunch and dinner. Eurorest is a fast food outlet situation right in the centre of Ayia Napa opposite the Castle Club. It is open from early evening through to early morning during the summer months and serves various fast food items for takeaway. Evinos taverna is located at the Eastern side of Ayia Napa, at the top of the Grecian bay road before the turn for the sea caves. Serving a range of Cypriot dishes and meze, Evinos is open for lunch and dinner during the summer months.